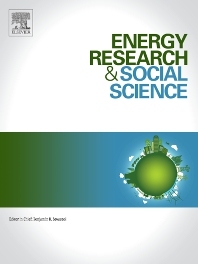 Energy Research & Social Science (ERSS) is a peer-reviewed international journal that publishes original research and review articles examining the relationship between energy systems and society. ERSS covers a range of topics revolving around the intersection of energy technologies, fuels, and resources on one side; and social processes and influences - including communities of energy users, people affected by energy production, social institutions, customs, traditions, behaviors, and policies - on the other. Put another way, ERSS investigates the social system surrounding energy technology and hardware. ERSS is of relevance for energy practitioners, researchers interested in the social aspects of energy production or use, and policymakers. Energy Research & Social Science (ERSS) provides an interdisciplinary forum for the discussion of how social and technical issues related to both energy production and consumption interact. Energy production, distribution, and consumption all have both technical and human components, and the latter involve the human causes and consequences of energy-related activities and processes as well as social structures that shape how people interact with energy systems. Energy analysis therefore needs to look beyond the dimensions of technology and economics to include these social and human elements. The journal's authorship is therefore not restricted to any discipline, but it is restricted in terms of quality and subject matter-articles are accepted based on merit, and their focus on the intersection of human activity (at whatever level of analysis) and energy systems (at whatever level of analysis). The editors emphasize that cross cultural, comparative, mixed-methods research is especially encouraged, and discourage submission of single-country case studies and/or studies that rely only on one method in isolation. Authors of single country studies, if submitted, must demonstrate that they have situated their study in the broader context and have highlighted the significance of their study. In addition, studies that utilize primarily engineering methods and econometric models must primarily focus on the "social" side of energy use and clearly meet the aims and scope of the journal. Disciplinarily, submissions are thus welcome from all fields of inquiry since the editors recognize that in many cases high quality research may not fit into any predetermined category. Moreover, the journal will not exclude any energy source, technology, system, topic, or energy service from the scope of its articles. Readers are actively encouraged to peruse past issues of ERSS to connect their piece to wider themes and discussions in the journal, especially the inaugural special issue available here. Articles submitted to the journal will undergo two levels of review. First, the editor(s) will screen them to determine their appropriateness to the aims and scope of the journal, as well as to gauge their methodological rigor and their quality of English writing. Reject - out of scope: rejects a paper (after editorial-review) with no chance for re-review, authors are not invited to revise and resubmit the manuscript; submission in current state is not suitable for the journal. To assist with the advancement of the journal, all authors of accepted articles in ERSS may be requested to review at least one article in the area of their expertise.